What is Vetoquinol Renal K+ Gel? Vetoquinol Renal K+ Gel helps restore the proper balance of potassium in cats and dogs who suffer from potassium deficiency. Common causes of potassium deficiency (hypokalemia) include the use of some medications, chronic kidney disease, chronic diarrhea, and dehydration. Vetoquinol Renal K+ Gel is a potassium supplement with B-Complex vitamins that is easy to administer and has a taste most pets love. NOTE: Vetoquinol Renal K+ Powder is also available. How does Vetoquinol Renal K+ Gel work? Vetoquinol Renal K+ Gel gently restores the proper balance of potassium in your pet's body following bouts of diarrhea, kidney disease or other causes of hypokalemia (decreased potassium levels). It comes as a convenient gel that can be given orally to your cat or dog, or as a powder to sprinkle or mix with your pet's favorite food. 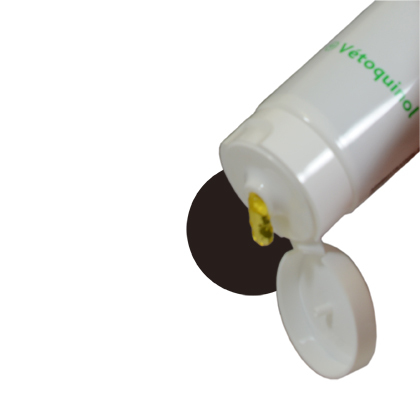 Vetoquinol Renal K+ Gel is a potassium supplment for potassium-deficient cats and dogs. 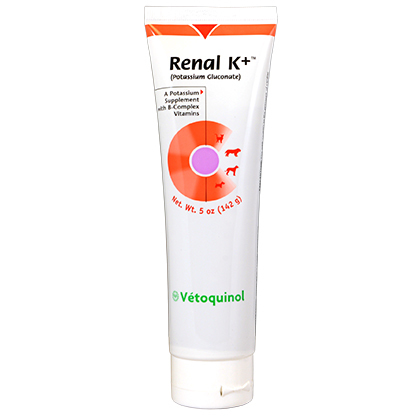 Vetoquinol Renal K+ Gel is a highly palatable gel. Place a small amount on your pet's nose to stimulate taste interest. Once initial interest has been established, gel may be administered from a syringe or teaspoon. Each 2.5 ml (1/2 teaspoon) contains 2 mEq of potassium (as potassium gluconate) in a palatable base. Give 1/2 teaspoon per 10 lbs of body weight orally twice a day. Adjust amount as needed. Store at controlled room temperature. Keep out of the reach of children. Purified Water, Potassium Gluconate, Sodium Carboxymethylcellulose, Potassium Sorbate, Sodium Benzoate, Artificial Sweetener, Maple Flavor, Citric Acid, Thiamine Hydrochloride, Nicotinamide, Calcium Pantothenate, Pyridoxine Hydrochloride, Riboflavin 5-Phosphate Sodium, Folic Acid, Biotin, and Cyanocobalamin.